The broad, rounded wings and flat face of our quiz bird look good for an owl of some kind. The wings look too long for any of the smaller owls, and the underparts are too dark and heavily marked for a a Snowy or Barn Owl. A Northern Hawk Owl would have a much longer tail and whitish underparts with fine barring. The heavy even mottling on the underparts doesn't look right for a Barred Owl, and if you look closely you can just make out a pale eye. A Great Horned Owl would have even broader wings than our quiz bird as well as fine dark barring on the underparts. That leaves Short-eared and Long-eared Owls to consider. The best way to tell these two apart in flight from below is by noting the pattern of the underparts. Short-eareds have fine dark streaking on the breast and upper belly (think juvenile Cooper's Hawk), while Long-eareds have thick barring and streaking on the breast and belly. 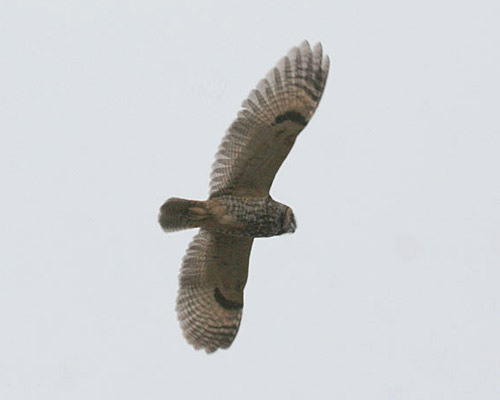 The underparts of our quiz bird look heavily barred and streaked, better for a Long-eared Owl. This Long-eared Owl was photographed at Montrose Point in Chicago on March 27, 2007 by Kanae Hirabayashi.